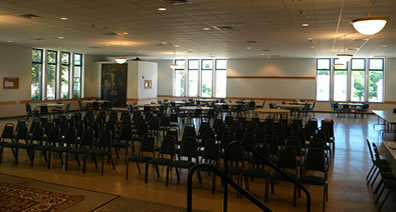 Our Parish Center has a full and active schedule. It is reserved by many parish groups, committee, Religious Education, scouts and our various ethnic and linguistic communities. As of February, 2019, it is no longer available for rent by the general public. Parishioners who have an activity in our parish (such as using it for a fellowship meal following a funeral Mass or burial in our cemetery, having a gathering or gala after an anniversary Mass or baptism, etc. ), may rent the hall for their personal, family or private group function by contacting our office staff in the links listed to the left. Rental of this space varies according to the size and time reserved. Reservations should include time for set up or decorations as well as the function itself. A deposit is required at the time of the reservation which will be returned after the rental fee is paid and once the function is completed if the hall is returned in a state of cleanliness as good or better than the space was received.